Most people use remote controls exclusively in order to open and close their garage door. Even though there are some more advanced options available today, such as smartphone apps, we've found that people often prefer the tactile remote. They are easy to use and maintain and can really reinforce the security of your whole family. There are numerous types, styles, sizes, and technologies out there, but, more or less they all have similar characteristics when it comes to the basic function of operating your door. If your garage door opener uses the latest rolling code technology, you more than likely have nothing to worry about. In the past, people feared their universal garage door remotes were susceptible to result in their door being used against them. 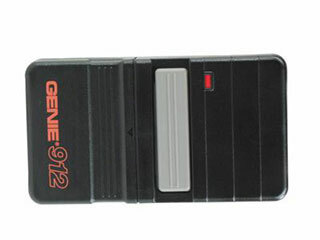 Anyone with a similar remote, or a remote that utilized similar technology and codes, would have been able to operate their garage door at his will. Unfortunately, yes. This wasn't some conspiracy theory. It was very true then, and is still a reality today, at least when it comes to plain or older opener models. However, rolling code technology prevents these types of security breaches. It forces your opener and remote to change their communication codes each time they communicate, i.e. each time you open or close your door, the codes change. That way, no one can use a similar remote to open your door. Even if they "hijack" your codes, they become irrelevant the moment you use them. Can I Have One Remote For Two Openers? In the past, you couldn't. Today, you can. A multicode remote can allow you to operate several garage door openers simultaneously. That means that you don't have to carry a few different remotes, only the one. Of course, this will depend on each opener's manufacturer, as some don't exactly play well with others. But as a general concept, yes. This is very possible. What Sort of Maintenance do Remotes Require? Checking your remote control's condition frequently is a good idea, as you don't want it to fail on you when you most need it. If the battery dies when you are trying to get in, you might get locked out. The simplest issues may create complicated problems, but this can be easily avoided if you take certain precautionary measures beforehand. First, make sure to keep extra batteries in your car. Secondly, every now and then, you should clean your remote's circuitry. Careful not to damage any part. Use a cotton swab to be extra gentle. If you suspect something's wrong with your garage door, or even with its remote, don't hesitate to reach out to our experts at Garage Door Repair Bartlett. It's better to be safe than sorry. Call us today.